Our Natural World is Really Not Well -- The weather now is indeed very hot and stifling, but being safe and well, we already need to be grateful. From the news, we can see that a lot of disasters are happening, and the land we live on is undergoing many calamities. In the U.S., a serious fire is raging in the state of Arizona. The fire has spread quickly and has already taken the lives of nineteen firefighters. A fire can break out at any time in such hot, dry weather, and once it does it can get out of control. That is why this is all so very worrying. At the same time, sudden heavy rain has caused flooding in China. Over ten provinces are in this situation, including Sichuan which suffered a major earthquake only recently. On top of this, Typhoon Rumbia is set to make landfall in Guangzhou, China—we really need to pray that this typhoon will not cause further devastation there. Our natural world is really not well—all around the world there are imbalances, causing disasters of fire, wind, water, or earth. This is very concerning. With so many disasters happening, we need to be grateful for our safety and be humbly vigilant as we go about our lives. We also need to respect Mother Nature and protect her instead of damaging her. Only then can our natural world be well and free of disasters. So, in our daily lives, we need to be more mindful in our behavior and of its impact on the environment. We are very concerned about the environment, which we depend on for survival. What should we do to help? 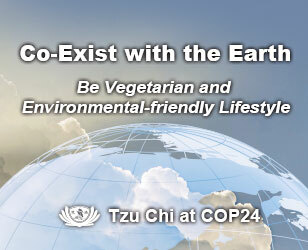 To Sow Seeds of Goodness -- Our mission as Tzu Chi people is to serve as a bodhisattva. In times of disaster, we really need to go forward to help, but we should also seize that chance to bring out locals' love and gradually guide them to become bodhisattvas themselves. 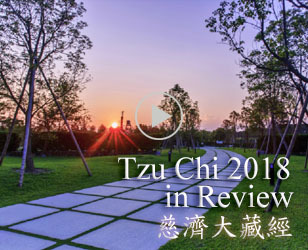 This is Tzu Chi's way—not only relieving suffering, but sowing seeds of goodness; as these seeds grow, gradually there will come to be bodhisattvas locally. 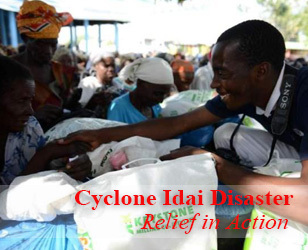 Be it the earthquake in Haiti in 2010 or the one in Chile in 2010, the Australia Queensland floods in 2011, or the New Zealand Christchurch earthquake in 2011, we can see locals who first encountered Tzu Chi because of the disaster and are now inspired to help others. From the Christchurch disaster and Tzu Chi's efforts there, we can see that as long as we help people with genuine sincerity, that spirit will touch them and inspire their own goodness and love. We can especially see this in Chile—locals who encountered Tzu Chi through the earthquake relief are now Tzu Chi volunteers who care for the poor, provide assistance at a home for people with cerebral palsy, carry out winter aid distributions, and provide aid in times of accidents or disasters. Though there are only a small number of volunteers, their persistent efforts have already earned the trust of local authorities who now turn to Tzu Chi for help in times of disaster, as they did after the recent fire in Chile that destroyed many homes. Three years ago, there were no Tzu Chi volunteers in Chile; now there are already bodhisattvas there, coming to people's aid. From this, we see that there can be bodhisattvas anywhere—we just need to seize the chances we have, be it in times of disaster or peace, to inspire the love and goodness in people's hearts. As long as we help others with genuine sincerity, people's love can be inspired and they can go on to help others and become bodhisattvas. While it is very hot here in Taiwan, we see news about wildfires in the U.S. and a factory fire in the U.K., fires which are threatening human lives and destroying communities. What can we do when faced with such heartwrenching devastation? At such a time, we need to feel people's suffering as our own and care for people in need in our community. By practicing the spirit of a living bodhisattva, we can create blessings for the community so there can be a better future. Threats to Human Life -- Just as we take care of our body in everyday life to maintain good health and prevent illness, our natural world also needs to be kept healthy and balanced. But, we see extreme weather conditions which show us that Nature is already out of balance—some places are suffering drought while others are being devastated by over-abundant rainfall. In the U.S. where massive wildfires are raging, the dry weather is making it especially difficult to contain the fires. Meanwhile, in Inner Mongolia, days of heavy rain have caused landslides in 79 locations, cutting off roads and burying vehicles on the road. Such disasters not only cause damage to the mountains but are also a big threat to human life. Seeing all this, we truly need to take action to protect Mother Nature. We should start from our lifestyle, such as by eating vegetarian. Only when human beings stop the harm being done to Mother Nature can her balance be restored. In truth, only when Mother Nature is healthy and well can we humankind living on this planet be safe and well. Think about the Cause and Effect -- From the news of the Arizona fires still raging after many days' efforts at containment, and which have already taken the lives of 19 firefighters, we see that once a fire starts, it can get out of control, with heartbreaking consequences—massive tracts of forestland are destroyed and precious lives have been sacrificed. How do such fires start? We should learn more about this and think about the cause and effect relationship in it. Careless Actions and Devastating Consequences -- Our one careless action can have devastating consequences that not only harm other people but also the public at large—we can see this in the fire that broke out in a plastic factory in the U.K. It began because someone released a sky lantern which landed in the factory, starting a fire that quickly spread and burned for several days. Not only were the factory and surrounding area destroyed, more than 10 firefighters were injured and the toxic fumes from the fire were released into the air. Reports say that many fires have been started by falling sky lanterns. So, sky lanterns truly are dangerous as we never know where they will land. We really ought to rethink this tradition of setting off sky lanterns for entertainment or on religious occasions. But it's not only sky lanterns—in general, we must be more mindful and disciplined in our daily living. One action of ours can cause great harm to the public. Living Bodhisattvas Create Blessings for the Community -- In China, locals are starting to take on Tzu Chi's work; as a result, many poor people are now able to get aid and care. Learning from the way of Tzu Chi volunteers in Taiwan, local volunteers in China are making home visits to help people in hardship, such as the elderly who live alone, the poor, and the disabled, and also to survey their needs to prepare for the upcoming large-scale winter relief distributions. The people being helped really look forward to these visits because the Tzu Chi volunteers' way of caring is so heartwarming: they give them a haircut and help them get cleaned up, as well as tidy up and do repairs on their house, etc. It's the way family would care for each other. These care recipients have never before had anyone show them such love and care. This care means even more to them than the material aid they receive from Tzu Chi. Look at this: these volunteers were originally just ordinary local residents in China; now they are bodhisattvas relieving suffering in areas near them. They care about complete strangers, and feel the people's suffering as their own, and this motivates them to dedicate themselves to easing the people's hardships. I'm very touched and grateful to see such living bodhisattvas in China now. Indeed, the more bodhisattvas there are, the more people can receive the help they need to come out of suffering. Let us work harder to spread the bodhisattva spirit to more people, so that there can be bodhisattvas in every part of the world, caring for people in need and creating blessings for their community. When we pay attention to and care about what is happening in the world, we can't help but wonder why there are so many disasters putting so many people into situations of hardship. We really need to work harder to bring out people's love—collectively, we can do a lot of good to benefit society as a whole. This is something that affects our wellbeing and survival. What is Happening to Our World -- Every day, we talk about the many disasters that are happening. It's because living on this planet, Mother Nature's wellbeing means our wellbeing; if Mother Nature is not well, it really is a concern, for it will affect our survival. So, we really need to pay attention to and care about what is happening. Seeing all the disasters going on, such as the wildfires in the U.S. which have yet to be put out due to the weather being especially hot and dry, and the earthquake in Indonesia where the number of casualties is still unknown, I can't help but think: What is happening to our world? Why is it so unbalanced, causing so many disasters? This is truly worrying. All these calamities are a global concern; they threaten the welfare of people everywhere. We Must Live with the Consequences -- In Vietnam, we have Tzu Chi volunteers locally and in the course of their charity work, they witness the consequences of war as they encounter people suffering from birth defects or other health problems due to the chemical agents (such as Agent Orange) used during the Vietnam War. The long-term harm to people and to the land is very serious, but in truth, this was all man-made. Why do human beings do such things? Living on this beautiful land rich with resources to sustain our lives, it is possible for us to lead lives of peace and security. Yet why do we instead have countries in upheaval, when it is only a small minority of people who have extreme ideologies? It has much to do with the blindness of us citizens at large—a blindness stemming from our afflictions and illusions which cause us to confuse what is right and wrong—so, we get whipped up by the rhetoric and join in the agitation, which spirals into unrest throughout the country. How many innocent people get harmed and have their lives ruined? Seeing what happened in Vietnam and the people who must live with defects and impairments for life, my heart really goes out to them deeply. Starting from now, we really need to work harder to purify people's hearts—to help people's hearts become more peaceful, harmonious, and balanced—so they can bring out their love to work for the good of others. We Work to Bring Out the Love -- How to go about 'purifying people's hearts'? In Vietnam, we see our handful of volunteers starting to do this, as they gathered a group of people to join them in visiting families in need. They care for the people like family, taking care of their material, medical, and physical needs by offering supplies, bringing medical personnel to them, helping them to cut their hair and get cleaned up, etc. When they put their minds to it, all the participants had abilities they could put to use to help the care recipients. Our Actions Impact Everyone's Welfare -- As citizens of our society, our actions impact the welfare of others while others' actions also impact our own. If all of us have love in our hearts, a lot of good can be done to benefit society as a whole. But if we all follow our bad, selfish thoughts, our society will be rocked by turmoil and unrest. It all depends on whether it is the good or the bad that is being circulated. We should help the good to circulate: when others are doing good, we should support their efforts and furthermore give them a helping hand. That is a positive, wholesome cycle. If instead, we disparage or criticize the good that people are doing, that sets off a negative cycle, which could eventually build up into a major problem or even crisis. Knowing this, we must watch over ourselves carefully and actively 'circulate the good'. Every day, we must sincerely pray for the wellbeing of others and always work to benefit others. Our World Needs Tzu Chi -- With so many disasters and people suffering hardships, our world really needs bodhisattvas relieving suffering and bettering people's lives. This is very important. This is what our Tzu Chi volunteers in each and every country are doing. This is what it means to "be a bodhisattva in this world".